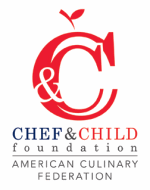 AAC and Chef & Child - ACF Chefs de Cuisine Association of St. Louis, Inc. The honor society of ACF, the American Academy of Chefs (AAC) represents the highest standards of professionalism in the organization, society and industry. The Academy’s primary mission is to promote the education of all culinarians by mentoring culinarians, awarding scholarships to students seeking a future in the culinary industry, and by providing grants to professional working chefs looking to further their career. Meet the Academy Board Members. The purpose of Chef and Child is to educate and assist the family in understanding proper nutrition. and sisters, and even for themselves and their parents. community. They will introduce children to foods they might not come in contact with in their daily lives. box, not from a cow. This year the St Louis Chef de Cuisine Chef and Child program has reached 3800 preschool and elementary children in 22 programs. We have made presentations to 42 groups to introduce our nutrition curriculum. Cultivating Young Cooks, held annually at the Missouri Botanical Garden offers parents, children and teachers an opportunity to taste healthy nutritious foods prepared by ACF chefs, to sample healthy snacks and to participate in hands on activities that include, milking a goat, making mozzarella cheese and to taste the high protein smacks made from bugs. This year’s event was attended by 2500 people. The mission of ACFEF’s Chef & Child initiative is to educate children and families in understanding proper nutrition by providing tools and resources for community-based programs led by American Culinary Federation chef members. Learn more about the history of Chef & Child.